Many are not aware of how a CPA is different from a bookkeeper, tax preparer, financial planner or other accountants. The CPA designation is one of the most widely recognized, respected and highly trusted professional designation in the business world. CPAs are distinguished from other finance and accountant professionals by strict qualification, experience and licensing requirements. We have worked hard to obtain our CPA, CA designation, and we are committed to working even harder to deliver the value that it conveys. It usually takes a minimum of 7 years from the first year of university until graduation, and successfully completing the exams considered some of the hardest in Canada to pass and accumulating the required hours eventually be granted permission to use the CPA, CA title. As CPAs, we are regulated by the CPA's national and provincial professional bodies. 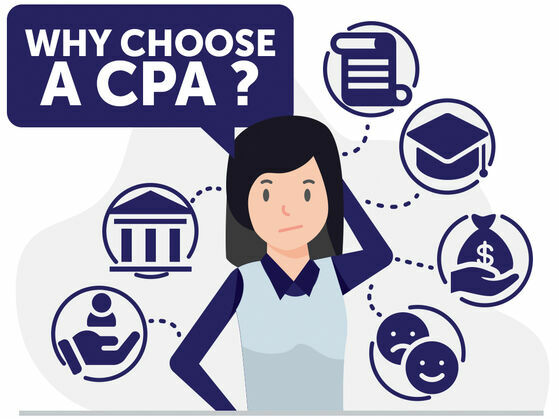 Regulation by a professional body is usually one of the main reason's clients seek CPA advice - to ensure that they are dealing with true professionals that can be held accountable for their actions if ever the CPA code of ethics is not respected or for any other dispute between the client and the CPA. We have a rule of professional conduct and code of ethics as CPA's, if we deviate or fail to respect the code we would have to face sanctions by the professional body of CPAs which can include monetary penalties or permanent expulsion from the order of CPAs in severe cases. Every 3 years, we are required to get audited (professional inspection) by CPA Ontario. During that inspection, they make sure that the CPA firm is up-to-date with current accounting rules and practice. CPAs require yearly training related to our field of expertise. The minimum yearly hours required is 25, and a minimum of 120 hours of structured continuing education over a 3-year period. We, at the office, have been averaging over 100 hours of training a year by each of our CPAs. This means that you can trust that we will always be up-to-date with the most updated accounting and tax changes affecting you. As CPAs, we are required to have a minimum of $1,500,000 in professional liability insurance. Non-CPA firms, or bookkeeper firms, do not have such requirements; therefore, if a non-CPA firm provides accounting or tax work and were negligent in their work, a client might not be able to recover their loss caused by improper advice, or to make a complaint to a professional body. Only CPAs who are licenced public accountants are allowed to perform audits or review engagement. When banks require financial statements, such as a simple notice to reader (NTR), they require, and expect, a CPA who is a licenced public accountant to have signed the NTR report. This is common when a business has a commercial loan or line of credit, and the bank needs yearly financials. Most CPA's have a very broad knowledge base in addition to tax and accounting, which can greatly benefit clients. When you see a CPA at our firm, you can expect to not only receive expert advice in both accounting and tax, but also in financial planning, estate planning, trust planning, basic knowledge of laws that govern those areas and plenty more. We have CPA’s that have CFP designation, TEP designation, Pl. Fin designation and even a master’s in tax. Therefore, when you meet with a CPA, you can expect an in-depth discussion about the overall picture of your situation.